First, I went to Cyprus, to speak for the Lindell (you’ve seen the My Pillow guy on TV?) Foundation. RREACH has given them fast growth potential through offering our GPA grads to be in-country validators as they seek to provide economic help to pastors’ families and more. The Lord used me there and it is always great to see our pastoral leaders anywhere. And then I went to speak on behalf of my mentor Fred Smith’s (breakfastwithfred.com) legacy. A “millennial” audience filled the Illinois university chapel and was deeply attentive and responsive. I did not diminish their future potential by stereotyping them. Before I went off again, the RREACH Board met for 24 hours of deep reflection and decisive action on this transition year of “proclamation reclamation.” How much I appreciate the wise counsel and wide perspectives of multiple voices which speak into my life. I didn’t realize that I was on a seven-day around-the-world tour till a colleague pointed it out. Bonnie called it a whirlwind. In Bangkok for 28 hours with three different and lengthy speaking engagements, one of which was the first anniversary of the death of the one Thai leader without whom the GProCongress would not have happened last year. Then I traveled all the way to Eastern Europe to attend the grand finale of GPA Romania—pastors’ wives attended, too! It was fabulous. And simultaneously GPA Guinea Conakry (West Africa) and GPA St. Vincent/Grenadines (Caribbean region) were also happening. Oh! All that God is doing! Thank you for your terrific and timely prayer support, my friends. Please be our guest at the June 24 celebration banquet of the 2017 Dallas GPA. Keep us in your prayers. Greetings in the name of the Most High One, the Lord Jesus Christ! Greetings in the name of the Most High One, the Lord Jesus Christ! That’s how Dr. Ramesh Richard greeted attendees the first evening and every morning of the GProCongress for Pastoral Trainers held June 15 – 22 in Bangkok, Thailand. Thank you for your earnest prayer for Dr. Richard, the RREACH and GProCongress teams, and the GProCongress itself over many months. God received glory, and many participants are testifying to how He blessed them. The GProCongress follow-up team as they grow GProConneXt, the strategic Congress follow-up platform. 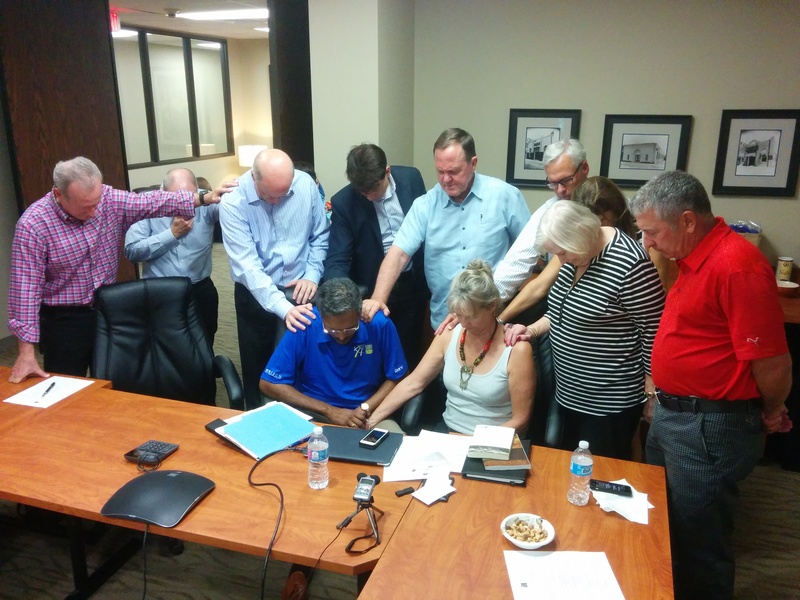 The RREACH board and friends praying over Dr. Richard and Bonnie following a GProCongress debriefing. Of course, he has also said, “Pastoral health affects church health, and church health affects societal health.” This is a day when healthy pastors can minister to those grieving, angry and even cynical. Your prayer and encouragement for Dr. Richard and RREACH are invaluable as we seek to strengthen pastors, the leaders on the front lines of this war, for God’s glory and the very best of many everywhere. In about five days, the Lord willing, the GProCongress for Pastoral Trainers will convene in Bangkok, Thailand. Congress team members and volunteers are arriving daily in Thailand for on-site preparation. When RREACH launched “the year of the GProCongress” last June, Dr. Richard asked for prayer for God’s Total Protection and Global Provision. God has answered our prayers in mighty ways, showing His clear intention for this event to take place despite some overwhelming challenges. For the health and beauty of Christ’s bride worldwide. Thank you for your prayer during the difficult time of Rev. Enoch Sirikul’s abrupt home-going and resulting challenges to GProCongress preparation. The Lord Jesus is inspiring Thai Christian leaders to carry forward Rev. Sirikul’s ministry in this land where less than 1 percent of the population identifies as Christian. He is also inspiring broader interest in the GProCongress. As you remember Rev. Sirikul’s family and all grieving his earthly loss, intercede for God to work mightily through those he trained. Specifically ask for His wisdom, guidance, protection and provision as Dr. Richard and the GProCongress team adjust and proceed with even more heartfelt urgency. Pray for the GProCongress registration team as registration activity has increased heavily. Pray for this trend to continue, technology systems to operate smoothly and visa challenges to be overcome. Also praise God for providing tremendous favor with the Thai government in regard to visas. Many pastoral trainers have acted in faith, obedience and hope as they paid Congress registration fees. They still need funding to travel to Bangkok. Please ask God to provide abundantly, so that now and in the years to come more may trust and rejoice in His name. Please ask Him for abundant spiritual provision for GProCongress presenters and coaches, also. In a few days, the Lord willing, Dr. Richard is to record some online curriculum sessions regarding the Holy Spirit. Pray for wisdom, strength and clarity, for God’s glory. Thank you! Preparing for the GProCongress for Pastoral Trainers has been an enormous test and affirmation of RREACH’s motto: ONLY GOD. Late last week a couple of well-coordinated thieves made off with Dr. Richard’s briefcase, which contained his computer, important Congress notes, several items of personal significance, and cash. The loss and subsequent challenges reemphasized our total dependence on God, and God only. The fact that Dr. Richard was not harmed and the generosity of his Brazilian hosts in helping with funds to cover part of the losses despite their own economic situation re-testify to how great the Only God is. Thank you so much for standing with Dr. Richard, RREACH and the GProCongress team in prayer and praise to Only God! robust development of the Congress follow-up strategy. Dr. Richard is in a mobilization sprint. After meeting with Latin American evangelical leaders in Honduras earlier this week, he returned to Dallas to assist some dear friends with the memorial service celebrating their young son. He left again yesterday evening for GProCongress vision-casting sessions in three major cities in two South American countries. Praise God for His sovereign care as Dr. Richard travels and ministers in many different ways, and pray that He will continue to be lifted up through Dr. Richard’s life and service.